This fun-loving couple was captured by me, their Riverside Farm Wedding Photographer, as they danced out of their wedding ceremony. The newlyweds made the most of their magical day at one of the East Coast’s most highly sought after wedding venues. The Riverside Farm is known for its magnificent views, lush fields, and incredible fare. The location is a working Vermont farm, and all of the delicious food served at Riverside weddings is produced locally. The venue makes it a true pleasure to be a Riverside Farm Wedding Photographer. 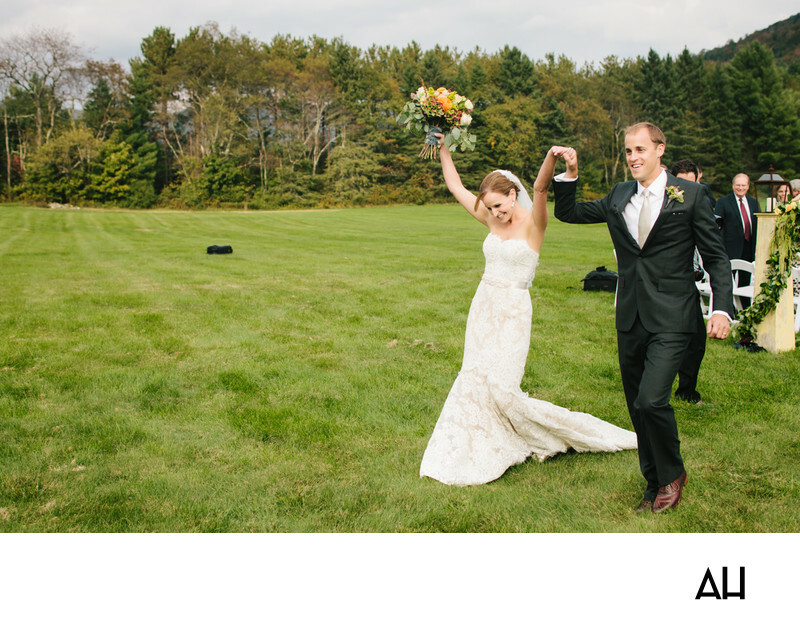 This couple chose to have their wedding ceremony outside, in the open fields of the farm. Saying vows outdoors is a trend that makes for exceptionally beautiful pictures at a wedding ceremony. There really is no better backdrop for a bride and groom than one provided by nature. The bride in this image is radiant in an ivory lace gown. She holds a bouquet of autumn colored flowers, which she raises toward the sky as she and her husband are cheered down the grassy aisle. The newlyweds are jubilant and very much ready to get the party started at their reception.